Heading just north of Lake Garda, the prevailing wind will lead you to the Dolomites. This mountain range eventually runs into the Italian Alps along the Austrian border. 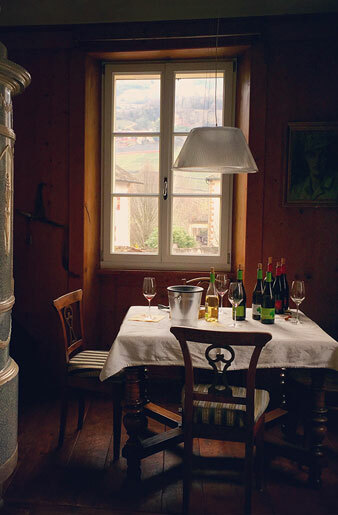 A small family winery known as Glassier has called this German speaking part of Alto Adige home since 1663. Stefan Vaja and his wife Linda represent the 9th generation of winemakers who produce wine and live in the same farm that was built by their ancestors. In German Glassier means “a closed in area surrounded by a stone wall.” In Sudtirol, German is their first language. They also speak Italian (thankfully for my sake!!) but from everything from architecture to food, this seems like a German colony within Italy. Glassier is located in the village of Egna, about 20 minutes south of the resort town of Bolzano. Ten minutes from the autostrada that runs north to Austria, Egna is a tiny village located in a valley which slowly makes its way up one of the many peaks in the Dolomites that make Sudtirol so beautiful. Sudtirol is an autonomous Italian province (there are a few of these in Italy) which allows them to stray from some of the usual hub bub in Rome and run a smooth, efficient… well, German economy!! Sudtirol has been part of Italy since post World War I. This region works like a well-oiled machine. Stefan is certainly a rock star winemaker in my mind. He is a farmer at heart and doesn’t care to impress you. He’s confident in the work he puts into his wine and his process, so it’s up to you to understand the quality within each bottle. This is very admirable and a confidence that I presume comes from 9 generations of history!! Stefan believes in organic winemaking, from the vine to the bottle. In the vineyards he does not intervene besides a limited use of sulfur and copper. He practices careful pruning in the winter and has very low yields, thus is careful to prune during growing season as well. At Glassier they produce Sauvignon Blanc, Pinot Bianco, Lagrein, Schiava and some Cabernet Sauvignon. 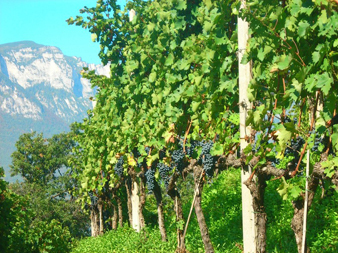 As their property is located in a valley, they have vines located on the hills above. Here you find their Lagrein, located at about 220 meters. Here there is no more than a hectare of vines. Regionally you find rows of vines trained to grow in a unique canopy style that helps shade grape clusters and provides some ease in pruning. This hill above the winery is where the family has historically produced wines, proven by the very old vines found here. For the other varietals Stefan (like many of his fellow tiny winemakers in the area) has carefully selected vineyards sites that suit the particular varietals. 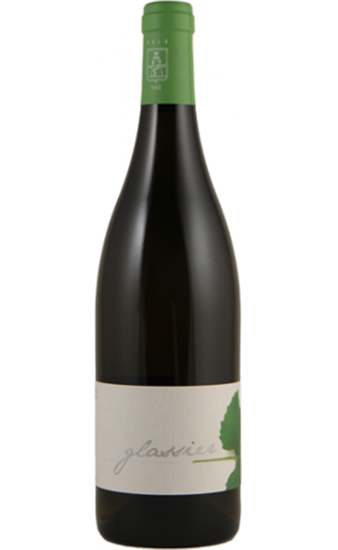 Take the Sauvignon, for example, which is located at 520 meters elevation and about a mile from the winery. This particular site has tons of stones and a very heavy limestone soil, which is a soil that has low acidity. About 50 cm under the soil is a solid layer of porphyry bedrock. These two factors combine to limit yields and make the vine truly struggle. This soil differs from that of the lower planted Lagrein, where you find more clay mixed with lime marl, sandstone and more of that porphyry. These combine to provide great minerality to his prized red wine. Here, like many regions in the world, it’s important to note that with the exception of Pinot Noir, the white wines will be found at higher elevation than the reds. The Sauvignon vineyard is about a half to 3/4 hectare in size and is located on a hill top that allows for great ventilation. It’s also protected by a woodsy area to the south that happens to be a national park, which is important to provide some shelter from the elements for this site. What’s always amazing is how quickly the terroir can change, and one gets the sense that this site is truly perfect for the Sauvignon. 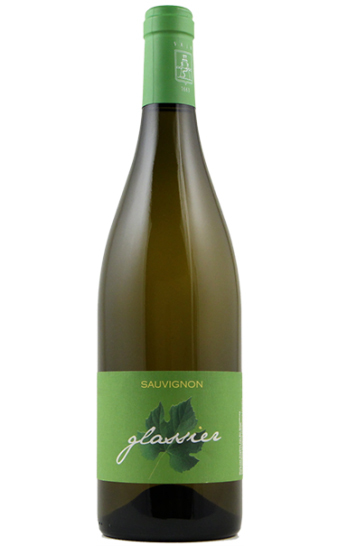 What is worth pointing out is that Sauvignon Blanc is considered somewhat of a native varietal in this part of Italy, as it was planted here by the French in the late 1800’s. Tasting these wines you will also notice that Sauvignon is distinctively different here compared to other parts of the world. In the winery Stefan’s wines undergo spontaneous fermentations and both the Sauvignon and Lagrein will spend time aging in big, neutral oak barrels. Sulfites are very limited, but it is worth pointing out for as careful as Stefan is about not intervening with his wines, he’s also very keen to limit some of the faults that can be found in natural wines. 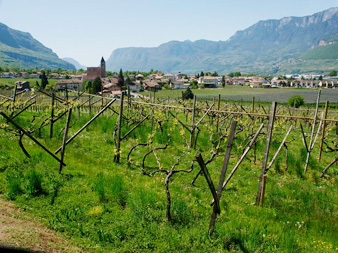 In the end he wants a terroir driven natural wine that is actually representative of the Alto Adige, not a wine that is so funky that one can’t clearly define it. The use of modern technology to limit exposure to oxygen is one example of how he is able to achieve this. The cellar is really a blast from the past. Built in the 1600’s, the cellar is entered through a ragged, green door that seems like it has probably fallen off the hinges a few times. The cellar floor is all wildly uneven stone, the ceilings are low and it’s pretty dark, save for some lights that Stefan installed. How can one make such incredible wines in here I always wonder? Total production at Glassier is around 15,000 bottles, and even that seems like a stretch if you consider how tiny the cellar is. My favorite part of the cellar is a tasting room, located a good 10 feet or so underground. In modern society this would be the ideal definition of a man cave. It has a German beer hall feel, with some drinkware that has been around for a few hundred years. When you venture upstairs to taste you find yourself in a very modern, German home. Amazingly Stefan and Linda still live in the same house built above the cellar centuries ago, but yet it’s modern and elegant. Of course many of the furnishings are old, but the house is straight out of a modern interior design magazine. Even the beams of the original home have been maintained. This is a humble, kind family whose wines are too good to be spurned for some of the larger wineries of the region, please seek them out! The house white at Glassier, Pinot Bianco is a wine Stefan always seems to be striving to get more complexity from. With time in the bottle he is able to achieve that. We’ve even waited on his 2014 juice until early 2017, for example, to allow the proper time it needs. Raw shelfish, linguine alle vongole, swordfish. The wine ferments in stainless steel and will rest on the fine lees in cement over the winter months. It rests at least 6 months in bottle before release. 2011 was a warm year at harvest. The luxury of working with small winemakers is that you will notice this less than larger producers who might allow sugar levels to skyrocket and fruit to be out of control in their wines. Because of the warm vintage you will taste ripe, rich white fruit. On the nose there are notes of rosemary and sage. The wine has great structure and minerality. It coats the mouth and lingers on the finish with some herbal notes. Hard to believe this is Sauvignon Blanc! Lobster, crab, shellfish. Charcuterie and also pork tenderloin. Grapes are harvested by hand. The wine ferments spontaneously with a few hours of skin contact. Wine will then age in large French oak barrels for 4/5 months, 3 of which are spent on the fine lees. The wine will undergo “battonage” in the barrel, where it is stirred with the lees to provide texture and color to the wine. From a 100 plus year old vine site adjacent to the cellar this Schiava is at the heart and soul of Glassier’s nine generations of winemaking. This is the wine that is lucky to leave the cellar as its seemingly destined for family consumption along with a tasty plate of speck. Speck, prosciutto, general charcuterie are a fun pairing. Vegetable dishes and lighter fare are ideal. During fermentation Stefan will rotate a small portion of the fermenting juice into stainless steel where he will stir the wine to help give it some oxygen and also some structure, which Schiava can often lack. Beyond this, the wine will age for a few months in stainless steel before bottling. It’s often ready to drink six months after harvest. 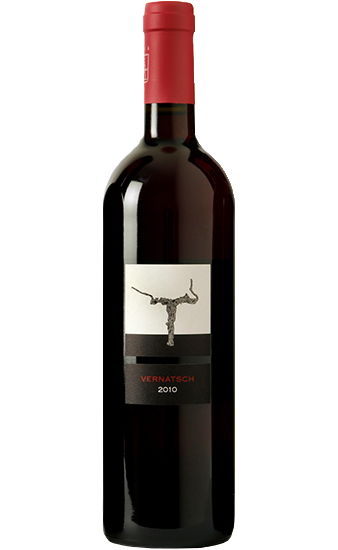 A cross between a lighter Austrian Red and Sangiovese would be the ideal way to describe this wine. This wine has lively fruit, like blackberry and other woodsy berries. There are also notes of roses and liquorish. 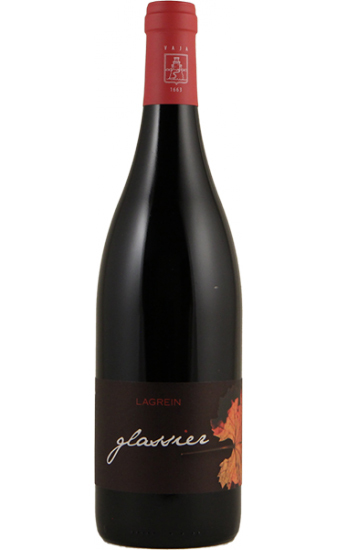 The wine has a slender medium bodied feel but with structure and a grippy quality to it. Its elegance is what makes it so intriguing, as it becomes more complex as you dig into it. This works well with wild game: duck, pheasant, venison. We can go heavier and pair this with roasted/grilled meats as well. Manual harvest followed by a spontaneous fermentation lasting up to three weeks. After being separated from the skins the wine will rest in stainless steel to naturally decant and will then spend a year aging in large French oak barrels.